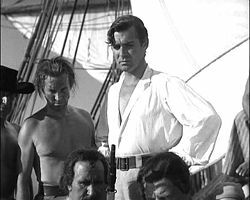 Clark Gable in the film Mutiny on the Bounty. Clark Gable (February 1, 1901 - November 16, 1960) was an iconic American actor, voted King of Hollywood by an adoring public throughout the 1930s and 1940s—Hollywood's Golden Age. His most iconic role was that of Rhett Butler in the 1930 epic film, Gone With the Wind, in which he starred with Vivien Leigh. In 1934, he won the Academy Award for Best Actor for his role in It Happened One Night also starring Claudette Colbert (who won the Academy Award for Best Actress). At the peak of his career, his wife, actress Carole Lombard (described as the "love of his life") was killed in a small plane crash while touring America to sell War Bonds at the onset of World War II. Although devastated, Gable himself enlisted in the U.S. Air Force for the remainder of the war. Gable died of a heart attack shortly after completing filming on The Misfits, (1961) a critically acclaimed film which co-starred Marilyn Monroe (it was also her final film). His premature death was partly blamed on the rigors of filming a western which was both psychologically and physically taxing. In this film Gable, who upheld the image of a virulent male until the end of his career, proved that he could bring depth and sensitivity to a characterization, reflecting both his love for literature and theater. Gable was born in Cadiz, Ohio to William Henry (Bill) Gable, an oil well driller, and Adeline Hershelman, both of German descent. He was mistakenly listed as a female on his birth certificate. His original name was probably William Clark Gable, but birth registrations, school records and other documents contradict one another. When he was six months old, his sickly mother had him baptized Roman Catholic. She died of an undisclosed illness when he was ten months old. For a period of time young Clark went to live with relatives before returning to his father's home. The loss of his mother would be a traumatic event for Gable that shaped much of his adult life. In April 1903, Gable's father married Jennie Dunlap. Gable was described as a tall shy child with a loud voice. Jennie played the piano and gave her stepson lessons at home. She encouraged his love for literature and music, while his father strongly encouraged more masculine pursuits for his son. In fact, even after Clark's rise to stardom his father never fully approved of his career choice. In 1917, when Gable was in high school, his father experienced financial setbacks and decided to try his hand at farming. He moved the family to Ravenna, Ohio, just outside of Akron. Gable had trouble settling down in the very rural area and despite his father's insistence that he tend the farm, Gable soon left to work in Akron's tire factories. At seventeen, Gable was inspired to be an actor after seeing the play, The Bird of Paradise, but he was not able to make a real start until he turned 21 and inherited money. By then, his stepmother Jennie had died and his father had returned to the oil business in Tulsa, Oklahoma. The young Gable toured in stock companies and worked the oil fields drifting from town to town. In Portland, Oregon, where he initially found work piling logs, he met actress Laura Hope Crews, (who later immortalized the role of Miss Pittypat in Gone With the Wind) who encouraged him to go back to the stage. His acting coach in Oregon was theater manager Josephine Dillon (17 years his senior) who quickly recognized Gable's potential and his determination. Dillon spent considerable time training Gable's naturally high-pitched voice; saying it was nervous and hard in quality and much too high in pitch, as is true with many big men. Gable would always have to work hard at voice control. Finally, after rigorous training she felt Gable was ready to break into films. In 1924, with Dillon's financial aid, the two went to Hollywood, where she became his manager and first wife. He found work as an extra in such silent films as The Plastic Age (1925), which starred Clara Bow, and Forbidden Paradise. However, Gable was not offered any major roles so he returned to the stage where he formed a lifelong friendship with Lionel Barrymore. During the 1927-28 theater season, Gable acted with the Laskin Brothers Stock Company in Houston, Texas, where he played many roles, gained considerable experience and became a local matinee idol. Gable then moved to New York City where Dillon sought work for him on Broadway. He received good reviews in Machinal, "He's young, vigorous, and brutally masculine," said the Morning Telegraph. The start of the Great Depression caused a shift in American's attention more towards the newly burgeoning film industry which promised entertainment relief for the hard times that most Americans were experiencing. Clark was drawn to the opportunities of Hollywood, but his first wife, for whom he had been both husband and protege, was not to be a part of his new life. In 1930, Gable and Dillon were divorced. A few days later, he married Texas socialite Ria Franklin Prentiss Lucas Langham who was also several years his senior. Together, with her two children, they moved back to Hollywood and discovered that the timing for a film career, juxtaposed with the advent of talking pictures, was strongly in Gable's favor. In 1930, after his impressive appearance as the seething and desperate character Killer Mears in the play The Last Mile, Gable was offered a contract with MGM, who boasted to have "more stars than there are in heaven." His first role in a sound picture was as the villain in a low-budget William Boyd western called The Painted Desert (1931). "His ears are too big and he looks like an ape," Warner Bros. executive Darryl F. Zanuck said about Clark Gable after testing him for the lead in Warner's gangster drama Little Caesar (1931) (a part which consequently went to Douglas Fairbanks, Jr.). Gable, initially sensitive about his ears after director Clarence Brown told him they should be taped to his head during filming, remarked: "Either you take me as I am or I will go back to New York." Gable worked mainly in supporting roles, often as the villain. MGM's publicity manager Howard Strickland developed Gable's studio image, playing up his "lumberjack in evening clothes" persona. To bolster his rocketing popularity, MGM frequently paired him with well-established female stars. Joan Crawford asked for him as her co-star in Dance, Fools, Dance (1931). He built his fame and public visibility in such important movies as A Free Soul (1931), in which he played a gangster who slapped Norma Shearer. The Hollywood Reporter wrote, "A star in the making has been made, one that, to our reckoning, will outdraw every other star… Never have we seen audiences work themselves into such enthusiasm as when Clark Gable walks on the screen." He followed that success with Susan Lenox (1931) starring Greta Garbo, and Possessed (1931), with Joan Crawford. Gable was considered for the role of Tarzan but lost out to Johnny Weissmuller's better physique and superior swimming prowess. After the hit Hold Your Man (1933) with Jean Harlow, MGM put them in two more films, China Seas (1935) and Wife vs. Secretary (1936). An enormously popular combination, on-screen and off-screen, Gable and Harlow made six films together, the most notable ones being Red Dust (1932) and Saratoga (1937). Harlow died of kidney failure during production of Saratoga. Ninety percent completed, the remaining scenes were filmed with long shots or doubles; Gable would say that he felt as if he were "in the arms of a ghost." In the following years, he acted in a succession of enormously popular pictures, earning him the undisputed title of King of Hollywood in 1938, when Ed Sullivan polled more than 20 million fans in his newspaper column. (Myrna Loy earned the sobriquet Queen of Hollywood.) Throughout most of the 1930s and the early 1940s, he was arguably the world's most important movie star, although he often felt insecure about his acting ability and instead was in awe of veteran actor Spencer Tracy. According to legendary director Frank Capra the story behind the making of It Happened One Night was more comical than the film itself. Based on the short story by Samuel Hopkins Adams called Night Bus its script was shelved for years and finally purchased by the struggling Columbia Pictures for $5,000. Gable, under contract to MGM was on reluctant loan for the picture. Claudette Colbert had to be lured from her vacation, but after an inauspicious start the stars went to work. About Gable's performance Capra later reflected, "Clark turned out to be the most wonderful egg. What I believe is that he was playing himself, and maybe for the only time in his career. That clowning, boyish roguish he-man was Gable. He was shy but a lot of fun with the people he knew. The role draped over him the way his custom-made clothes did: With casual perfection." Gable won the Academy Award for Best Actor for his 1934 performance of the hapless journalist looking for a scoop. (Colbert won for her role as the runaway heiress.) It Happened One Night swept the Oscars in five categories: Best actor, actress, director, best writer, and best picture. It would be 35 years before another picture would garner so many top awards. Gable returned to MGM a bigger star than ever but his second marriage was over; due to either the couple's age difference or the pressures of Hollywood. Clark Gable as Fletcher Christian in Mutiny on the Bounty. Despite his reluctance to play the role, Gable is best known for his performance in Gone with the Wind (1939), which earned him an Academy Award nomination for Best Actor. Carole Lombard may have been the first to suggest that he play Rhett (and she play Scarlett) when she bought him a copy of the bestseller which he refused to read. Gable was an almost immediate favorite for the role of Rhett Butler with both the public and producer David O. Selznick. But as Selznick had no male stars under long-term contract, he needed to go through the process of negotiating to borrow an actor from another studio. Gary Cooper was Selznick's first choice. When Cooper turned down the role, he was quoted as saying, "Gone With The Wind is going to be the biggest flop in Hollywood history. I’m glad it’ll be Clark Gable who’s falling flat on his nose, not me." By then, Selznick was determined to get Gable, and eventually found a way to borrow him from MGM. Gable was wary of potentially disappointing a public who had decided no one else could play the part. He later conceded, "I think I know now how a fly must react after being caught in a spider's web." His famous line, "Frankly, my dear, I don't give a damn," caused an uproar since it was in violation of the Production Code in effect at the time. Gable, beholden to his masculine image, resisted shedding tears for the scene where Scarlett (Leigh) has a miscarriage. Olivia de Havilland later commented, "… Oh, he would not do it. He would not! We had done it without him weeping several times and then we had one last try. I said, 'You can do it, I know you can do it and you will be wonderful …' Well, by heaven, just before the cameras rolled, you could see the tears come up at his eyes and he played the scene unforgettably well. He put his whole heart into it." Gable's marriage in 1939 to his third wife, successful actress Carole Lombard, was the happiest period of his personal life. Loved as a comedic actress on-screen, and famous for her practical jokes behind the scenes, Lombard gained stability from her marriage to Gable. Conversely, he thrived being around her youthful, charming, and blunt personality. She went hunting and fishing with him; younger than Gable, she wisely dedicated herself to taking care of the complex star, a man who cherished his privacy. About Lombard, he once said: "You can trust that little screwball with your life or your hopes or your weaknesses, and she wouldn't even know how to think about letting you down." They purchased a ranch at Encino, California, where they settled into a domestic routine away from the limelight. Although he called her "ma" and she called him "pa," their efforts to have a child were unsuccessful. On January 16, 1942, Lombard, who had just finished her 57th film, To Be or Not to Be, was on a tour to sell war bonds when the twin-engine DC-3 she was traveling in crashed into a mountain near Las Vegas, Nevada, killing all aboard including Lombard's mother. Gable flew to the site and saw the forest fire ignited by the burning plane. Lombard was declared the first war-related female casualty the U.S. suffered in World War II and Gable received a personal condolence note from Franklin D. Roosevelt. The Civil Aeronautics Board investigation cited "pilot error." Gable returned to their empty house and a month later to the studio to work with Lana Turner on Somewhere I'll Find You. Gable was devastated by the tragedy for many months and drank heavily but managed to perform professionally on the set. Gable resided the rest of his life at the couple's Encino home, made 27 more movies, and married twice more (once briefly). "But he was never the same," said Esther Williams. "His heart sank a bit." 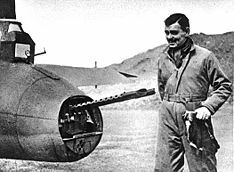 In 1942, following Lombard's death, Gable joined the U.S. Army Air Forces. Earning the rank of Captain, Gable trained with and accompanied the 351st Heavy Bomb Group as head of a 6-man motion picture unit making a gunnery training film. Gable spent most of the war in the UK at Wetherby and Polebrook. While at RAF Polebrook, England, Gable flew five combat missions, including one to Germany, as an observer-gunner in B-17 Flying Fortresses between May 4 and September 23, 1943, earning the Air Medal and the Distinguished Flying Cross for his efforts. Gable's first movie after World War II was the 1945 production of Adventure, with his co-star Greer Garson. It was a critical and commercial failure despite the famous teaser tagline, "Gable's back and Garson's got him." Gable was acclaimed for his performance in The Hucksters (1947), a satire of post-war Madison Avenue corruption and immorality. A very public and brief romance with Paulette Goddard occurred after that. In 1949, Gable married Sylvia Ashley, a British divorcée and the widow of Douglas Fairbanks Jr. The relationship was profoundly unsuccessful; they divorced in 1952. Soon followed Never Let Me Go (1953), opposite Gene Tierney. Tierney was a favorite of Gable and he was very disappointed when she was replaced in Mogambo (due to her mental health problems) by Grace Kelly. Mogambo (1953), directed by John Ford, was a Technicolor remake of his earlier film Red Dust, and went on to become an even greater success. Gable became increasingly unhappy with what he considered mediocre roles offered him by MGM, while the studio regarded his salary as excessive. Studio head Louis B. Mayer was fired in 1951, amid slumping Hollywood production and revenues, due primarily to the rising popularity of television. Studio chiefs struggling to cut costs fired many MGM stars, including Greer Garson and Judy Garland. In 1953, Gable refused to renew his contract, and began to work independently. His first two films were Soldier of Fortune and The Tall Men, both profitable though only modest successes. In 1955, Gable married his fifth wife, Kay Spreckels (née Kathleen Williams), a thrice-married former fashion model and actress who had previously been married to sugar-refining heir Adolph B. Spreckels Jr. In 1955, he paired with Doris Day in Teacher's Pet, shot in black in white to better hide his aging face and overweight physique. The film was good enough to bring Gable more film offers, including Run Silent, Run Deep, with co-star and producer Burt Lancaster, which featured his first on screen death since 1937, and which garnered good reviews. Gable started to receive television offers but rejected them outright, even though some of his peers, like his old flame Loretta Young, were flourishing in the new medium. His next two films were for Paramount Pictures: But Not for Me with Carroll Baker and It Started in Naples with Sophia Loren. At 58, Gable finally acknowledged, "Now it's time I act my age." Gable's last film was The Misfits, written by Arthur Miller, and directed by John Huston. It co-starred Marilyn Monroe, Eli Wallach, and Montgomery Clift. Many critics regard Gable's performance to be his finest, and Gable, after seeing the rough cuts, agreed. Gable had a daughter, Judy Lewis, the result of an affair with actress Loretta Young that began on the set of The Call of the Wild in 1934. While Young would never publicly acknowledge her daughter's real parentage, she finally gave her biographer permission to include it only on the condition the book would not be published until after her death. On March 20, 1961, Kay Gable gave birth to Gable's son, John Clark Gable, born four months after Clark's death. Gable died in Los Angeles, California, on November 16, 1960, the result of a fourth heart attack. There was much speculation that Gable's physically demanding Misfits role, which required yanking on and being dragged by horses, contributed to his sudden death soon after filming was completed. Others have blamed Gable's crash dieting before filming began. Additionally, Gable was a lifelong smoker. Gable is interred in Forest Lawn Memorial Park Cemetery in Glendale, California, beside Carole Lombard. Decades after the making of Gone With The Wind, Gable said that whenever his career would start to fade, a re-release of the film would instantly revive it; he continued as a top leading man for the rest of his life. Gone with the Wind was given theatrical re-releases in 1947, 1954, 1961, 1967 (in a widescreen version), and in 1971, 1989, and 1998. Gable's Oscar recently drew a top bid of $607,500 from Steven Spielberg, who promptly donated the statuette to the Academy of Motion Picture Arts and Sciences. In 1999, the American Film Institute named Gable seventh among the Greatest Male Stars of All Time. Gable and Joan Crawford were together in eight films, Myrna Loy was with him in seven, and Jean Harlow was with him in six. He also starred with Lana Turner in four features, and with Norma Shearer in three. Gable is known to have appeared as an extra in 13 films between 1924 and 1930. Between 1932 and 1942 he appeared in a total of 67 theatrically released motion pictures. During World War II he narrated and appeared in a short film entitled Combat America, produced by the United States Army Air Forces. ↑ Chrystopher Spicer, Clark Gable: Biography, Filmography, Bibliography (Jefferson, NC: McFarland & Company, 2002), ISBN 0-7864-1124-4. ↑ Dan Van Neste, Clark Gable Reconstructed Birthhome: Fit For A King. Retrieved April 4, 2008. ↑ Warren G. Harris, Clark Gable: A Biography (New York: Harmony, 2002, ISBN 0609604953). ↑ Lyn Torabene, Long Live the King. A Biography of Clark Gable (New York: G.P. Putnam & Sons., 1976, ISBN 0399118632). ↑ Turner Classic Movies, Leading Men: The 50 Most Unforgettable Actors of the Studio Era (Chronicle Books, 2006, ISBN 0811854671). ↑ David O. Selznick, Memo from David O. Selznick (New York: Modern Library, 2000, ISBN 0-375-75531-4). ↑ Paul Donnelley, Fade To Black: A Book Of Movie Obituaries (London: Omnibus Press, 2003, ISBN 0711995125). ↑ Anthony Breznican, Legends swirl around Gone With the Wind 65 years later. Retrieved April 3, 2008. ↑ Esther Williams and Digby Diehl, The Million Dollar Mermaid (New York: Simon & Schuster, 1999, ISBN 0684852845). ↑ Arthur Miller, Timebends (New York: Grove Press, 1987, ISBN 0-8021-0015-5). ↑ The American Widescreen Museum, Gone With the Wind. Retrieved November 19, 2008. Bret, David. 2007. Clark Gable: Tormented Star. New York: Carroll & Graf. ISBN 9780786720934. "Clark Gable." St. James Encyclopedia of Popular Culture. St. James Press, 2000. Harris, Warren G. 2002. Clark Gable: A Biography. New York: Harmony Books. ISBN 0609604953. Torabene, Lyn. 1976. Long Live the King: A Biography of Clark Gable. New York: G.P. Putnam & Sons. ISBN 0-671-81733-7. "(William) Clark Gable." Dictionary of America Biography: 1956-1960. Reproduced in Biography Resource Center. Farmington Hills, MI: Gale, 2008. All links retrieved February 24, 2017. Clark Gable on TV TV.com. This page was last modified on 24 February 2017, at 21:58.